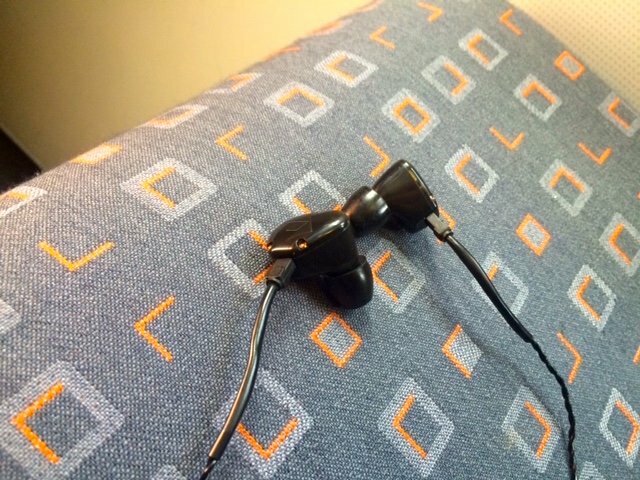 There are two types of earphones that travellers ought to consider; noise-cancelling, and in-ear monitors (IEM). The former give you near-silence in-flight – which is great for working and sleeping – but offer little in the way of musical quality (see the Bose QC20i for proof of that). The latter give you all the subtleties that great music deserves, and usually some pretty decent noise-osilation, too. The Savants are a supreme example of the latter. No, they’re not cheap. Hailing from the labs of Santa Barbara, USA-based Noble Audio, the Savants cost about the same as a top pair of noise-cancellers, in fact. You can tell that right after un-boxing (from a strange and not particular travel-friendly flight case-style box, no less), where each of the ears has large monitors. However, they’re surprisingly lightweight, so while they do stick out much further than your average pair of in-ears, it makes no difference to the wearer. A coiled cable, complete with an adjustable separator, makes the Savants genuinely easy to travel with. OK, so there are no in-line remote controls or a microphone for taking hands-free calls, but this, again, is evidence of Noble Audio’s narrow focus on sound quality. And that’s a good thing. If you’re after a wireless fix, there’s a Noble BTS Bluetooth Solution available for UK£69. They also come with a tiny velvet-like drawstring bag, which is rare for a pair of in-ears. Tested on a recent jaunt from Bristol to Glasgow, the Savants impressed. Easily grabbed from a shirt pocket, unfurled and fitted within seconds, they impress immediately after take-off, with the custom-fit ear-tips isolating noise very effectively. I managed to wear them for over two hours; these are comfortable, moulding into the shape of your ear immediately. You’re not going to fall asleep in silence with no music on while wearing the Savants, but armed with an ambient music app like Airsleep, it’s possible to drop-off very easily. Noise-cancelling they’re not, but there’s a lot to be said for travelling with a load of gear that needs regular recharging. Despite the Savants impressing at 40,000ft, they’re at their musical best on the ground. It’s while walking the streets that I really noticed the clarity. The hand of audiologist Dr. John Moulton AuD CCC – Noble Audio co-owner – is obvious right from the start of Guy Garvey’s Juggernaut from Courting The Squall. The song’s subtle piano intro melds into Garvey’s spat vocals, the clarity and stereo separation sublime throughout. The Savants are all about the detail. With Bjork’s haunting Hunter from the legendary Homegenic album, the Savants do almost as well, delivering both the orchestral detail and uncovering the electronica bass sounds in a far more enveloping manner that most in-ears. The Savants aren’t built specifically for travel, of course; they’re designed for anyone after top quality sound. They deliver on that promise with a bullet, but with effective in-ears that isolate plane noise along with a sturdy tangle-free design, the Savants deserve a place in the top pocket of anyone after compact yet crystal clear in-flight audio.